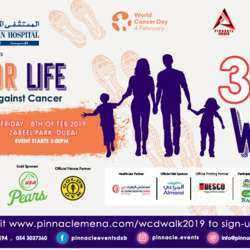 We are inviting all to the of Walk For Life – Positive Action Against Cancer in support of the World Cancer Day on the 8th of February, Protected content at 3:00 pm at Zabeel Park, Dubai. It will FUN-FILLED DAY full of activities for the entire family, games and prizes! FREE MEDICAL CHECK-UP from our healthcare partners and FREEBIES from our sponsors will be given away. To register, click on Protected content fill in the form, click the SUBMIT button and you're good to go.